I was excited with the release of WordPress 3.1 which added the Post Formats feature. This provides the ability to create themes for customized display of content based on new types of content that you create. Sure there were hacks to do this before, but now that it’s supported natively there will be many new themes coming out to support it and make it easy. The cool thing about Post Formats is the content types lend themselves very nicely to Lifestreaming. This is something that Tumblr users have been enjoying for a long time and the WordPress folks have definitely noticed this distinction and now have an answer for it. As you can see these custom post types are perfect for segregating your content. I’ve been keeping my eye out for new themes that take advantage of this new feature but they’ve been hard to find. I just recently heard about a new one called Tapestry over at WordPress.com that is actually a child theme built on the very popular Genesis framework. 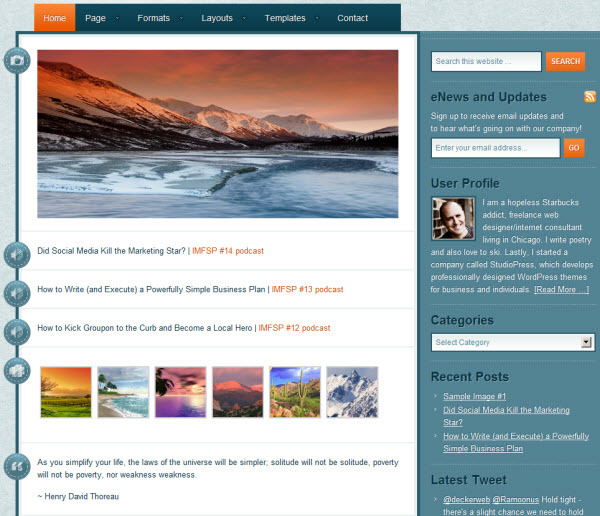 This theme does cost $79.95 but has many great features beyond simply supporting Post Formats. You can view a live demo here and visit the main page here. If you aren’t familiar with WordPress’ new Post Formats feature you should definitely check it out. If you know of any other themes out there that support post formats please share them in the comments so I can update this post. I’ve been clinging on to my SweetCron install for some time now, but a theme like this might be just enough to get me to change. I love the way it has a separate format for each type of content (something severely missing for SweetCron) and Tumblr like tags to differentiate the content types. The Tweets still probably take up too much space overall, but it’s definitely a step in the right direction.